Many of Hunt Nation’s clients hail from east of the Mississippi, so we are always on the lookout for great new opportunities that are a bit closer to home for these folks. So when this operation approached us in early 2018 about partnering with them to market their Maine bear hunts, we were all ears. Hunts are conducted on almost 100 square miles of exclusive territory in a remote but scenic area of Maine wilderness (some stands are accessible only by boat). Only fall hunts are offered, but you can choose to hunt either over bait or using hounds, and any legal weapon is welcome. 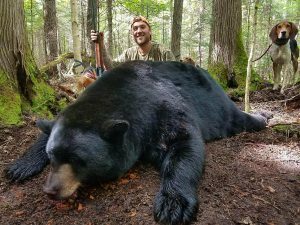 The outfitter himself has been a registered guide in Maine since the age of 18, so he’s got lots of experience, and this results in about 80% of clients getting a bear. Bears range from 4.5’ to 7’ and weigh 150 to 300 lbs. ; now and then a 400-500 lbs. bear is taken, generally with the hounds. When you’re not bear hunting, fishing and grouse or goose hunting (when in season) are available. Families and other on-hunting guests are welcome too, and the available fishing, ATV tours, trap shooting, archery course and boating will give them plenty to do while you’re hunting. The Maine black bear is smart, so the staff work hard to position bait sites so they are too attractive for the big bears to pass up. They invest great effort to find good habitat, and consider hunting variables like approach to the stand and wind direction, and also use trail cameras to ensure they are putting all clients on active baits. You will head for your hunting stand after lunch each day and sit until dark. You’ll be provided with a two-way radio to notify your guide once you have harvested a bear, so you don’t need to wait needlessly in your bear stand. These hunts start the last week of August and run to mid-September. There is no Sunday hunting in Maine. This is a fast-paced, high-adrenaline bear hunt. 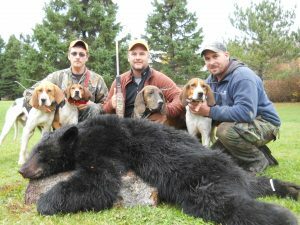 Hounds help hunters harvest the largest bears in the woods – nocturnal bruins that avoid bait sites during daytime hours. Success rates are high and trophy bears are common. Although the terrain is challenging, this hunt is not as physical as many hound hunts because logging roads improve access to remote habitat. Well-trained hounds track bears from active bait sites that are monitored by trail cameras. Bears are pursued to their hiding places so you can get a shot at your trophy. These hunts start in mid-September, after the baited hunts are finished, and continue into early October. There is no Sunday hunting in Maine. $900 for non-hunting guests. $500 for single occupancy. $1,300 for non-hunting observers. $300 for a morning of goose hunting, September only (6 bird limit). $300 for a morning of musky fishing (2 person minimum). $1,800 for private 1×1 guide (normally there are up to 5 clients per guide at the start of each week) and transportation during the week. $150 round trip transportation from Presque Isle Airport or hotels. The American Plan rate includes accommodations, 3 meals a day, 6 nights’ stay, 5 days of guided hunting from modern tree stands or blinds, use of 5-watt private channel two-way radios for communication with the guide during the hunt, safety and hunting orientation meeting, and use of canoes and kayaks. The guide will help recover and field dress your bear, drive you to the tagging station, and to the butcher. He will also transport the hide to a local taxidermist. 9% Maine sales tax, transportation to the lodge, license & bear tag (about $182 for non-resident), skinning, butchering, taxidermy, airport transportation, and gratuities. Airport transportation from Presque Isle is $75 each way. The butcher will handle skinning for around $75-$125 and process, vacuum pack, and freeze the animal for around $1 per pound. He will also freeze the hide in a box or they can transport it to a local taxidermist. Insulated shipping boxes are available at about $30 each, and packing and FEDEX shipping services are also available. $800 for non-hunting guests staying in camp, or $1,300 for such guests joining as an observer in the field. The American Plan includes 3-day guided hound hunt, up to 6 nights’ accommodations (the exact hunt dates vary as each hunt begins when dogs and handlers become available) and 3 meals a day, and use of canoes and kayaks. The guide will help recover and field dress your bear, drive you to the tagging station and to the butcher. He will also transport the hide to a local taxidermist. 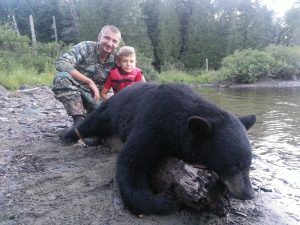 Please purchase in advance a hunting license and bear permit online from Maine’s Department of Inland Fisheries & Wildlife’s online system called MOSES: https://moses.informe.org/cgi-bin/online/moses_v3/index. A 50% deposit is required upon booking, payable to Hunt Nation. The balance is due by June 30 for baited hunts, and 30 days before your trip for hound hunts. The outfitter will send you an invoice. You will be staying in a comfortable lakeside log cabin with private bath, on the shores of a large lake. Meals featuring Maine lobster and prime meats are served in an historic and licensed dining hall in the lodge. The lodge has satellite phone and internet service for your use, but the connection can be poor at times. Drive or fly to Presque Isle, Maine. United Airlines offers a non-stop from Newark, New Jersey to Presque Isle (PQI), which is just 45 miles from camp. The outfitter will pick you up from there for the 90-minute truck ride to the camp for $75 each way, per person. Another option is to fly to Bangor, Maine (BGR) and rent a car for the 3 to 4-hour drive. Bangor is served by Delta, American, and others. Portland, Maine (PWM) is 5 hours by car and is served by discount airlines. The outfitter can even arrange charter flights and, weather permitting, a transfer to a float plane for the trip to camp. ONCE YOU HAVE BOOKED THIS TRIP, PLEASE REMEMBER TO ASK US FOR A SUGGESTED PACKING LIST, DIRECTIONS, AND LIST OF FAQ. This outfitter is now also offering spring hunts in northwestern New Brunswick in a 200-square mile remote territory that has never been commercially hunted. Accommodations are in an off-the-grid luxury lodge and cabins, with gourmet meals. Hunts are mainly over bait (about 50 bait sites), but calling and spot & stalk may also be utilized as the boars will be rutting at this time. Only 9 hunters in camp at a time. 5-day hunts are $2,950 USD each for 3×1 guiding. 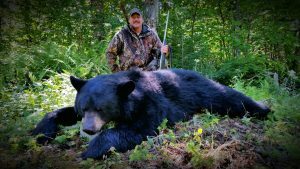 VIP hunts with a 1×1 guide to call in bears and judge trophy quality is $5,000 USD. 2nd bear is $1,200 USD. Price includes taxes, but does not include license (about $120) or transportation to camp from local airport ($150 USD each way).